Adama was five months pregnant when the world around her started to flicker and fade. Because of cataracts in her eyes, soon all she could see were shadows and shapes. Months passed as her vision continued to dwindle. 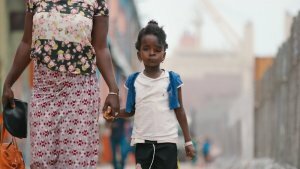 ‘Maybe it will clear up after I give birth,’ she told herself, hoping that the loss of sight was somehow linked to her pregnancy.But once she’d delivered her twin babies — a boy and a girl — 30-year-old Adama had to face the truth. She was blind and afraid that she might never be able to see the faces of her newborns. 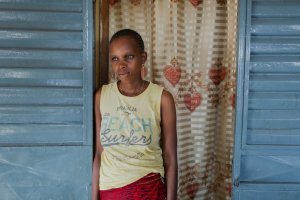 And without access to affordable, safe surgery, she felt like there was nothing that could fix her sight. Adama, along with her newborns and four other children, moved in with her older sister, Aissatou, who became their caretaker. Aissatou welcomed them in lovingly, but with her own children to take care of, the burden was heavy. ‘It’s been a very hard year,’ Aissatou reflected in tears. Adama’s blindness stretched on for almost a year. The twins were six months old, their faces still a mystery to their mother, when her husband first heard about Mercy Ships. For this family, the opportunity to access a state-of-the-art hospital ship meant more than just free surgery. It meant giving Adama the chance to step out of the darkness. It meant being able to take care of her family instead of depending on others for help. It meant being able to see her loved ones again. The day after her operation on the Africa Mercy, Adama sat on a wooden bench waiting for her eye patch to be removed. It was the moment she’d learn whether or not her eyesight had returned fully. As the patch was peeled back, Adama kept her eyes closed for a few moments. Gradually, she blinked them open. A smile slowly spread across her face as she realized she was seeing the world again for the first time in almost a year. She reached for her twins, drinking in the details of their faces for the first time. Tiny noses; long eyelashes; round cheeks — Adama cradled them both in her arms at the same time, eyes dancing between the two. ‘I never expected that my babies would be so beautiful,’ she murmured. The impact of her restored sight will reverberate throughout the rest of her life. There will likely be countless moments where Adama rejoices because of the ability to see again — but it’s hard to imagine a moment more meaningful than a mother’s patient love being rewarded with the sight of her children for the first time. 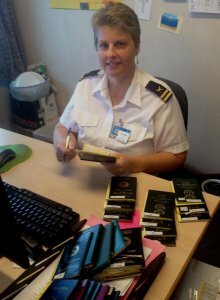 In November Miriam packed her bags and made the long trek from Auckland to Guinea, West Africa for her seven-week tour-of-duty. She worked alongside another radiographer onboard. 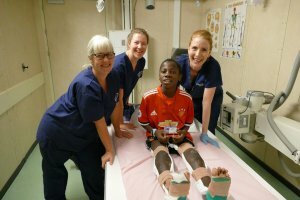 Miriam’s tasks included performing x-rays on the Mercy Ships patients as part of their pre-surgery assessment, sometimes during their stay, and before they were discharged. Nabinti had a CT-scan performed by Miriam on her first day at work on board! The images were a vital part of her assessment and treatment plan. 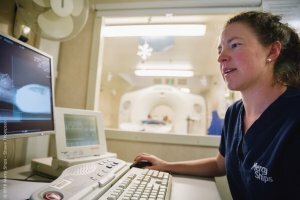 Normally there is only one CAT scan for the entire population 12 million people in Guinea, West Africa and accessing the service at $250 a time is well beyond the reach of the vast majority. 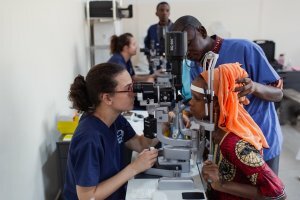 Miriam’s services doubles that capacity and, as with all mercy Ships services, it is provided free to charge to the patients. Captain John Borrow taking a navigational fix during the sail. John Borrow never planned on being a full-time volunteer, but when he first heard about Mercy Ships in the 1990’s he knew it was an opportunity he couldn’t ignore.His long journey with the not-for-profit that operates the world’s largest civilian hospital ship, Africa Mercy, has taken Mr Borrow and his family from Sydney around the world. From 2016 to 2018 he served as the flagship’s Captain. 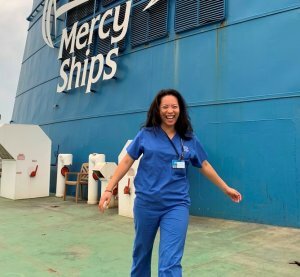 More than 400 volunteers from over 40 nations live and work on board the Mercy Ship, providing free surgical essential services and health care education to those without access in the developing world. Borrow learnt of Mercy Ships through a friend. 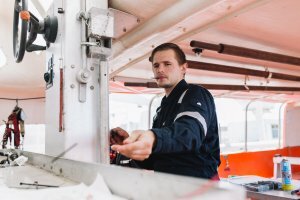 After setting foot on board during a visit while a ship was in port in New South Wales, he knew he wanted to be part of its crew. 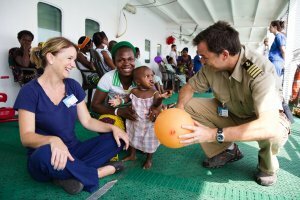 Joining the Mercy Ship as Third Officer, Borrow travelled to Papua New Guinea on a three-month assignment and was enthralled by the experience. After hearing about the trip, his partner Lee-Anne, who was a dietitian and had just finished her master’s degree in nutrition, was also eager to join. 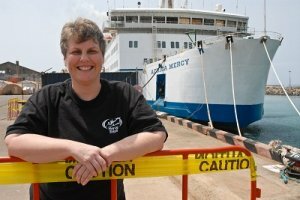 After the couple married in 2001, they boarded the now-retired Caribbean Mercy, where Borrow volunteered as Chief Officer before moving on to the original Mercy Ship, Anastasis, in 2005, where the couple raised their first son for the first 18 months of his life. Eventually ,they returned to Australia to have their second son. 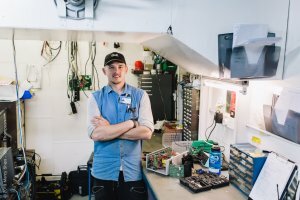 After 8 years of being at home and working ashore Borrow knew it was time to return to Mercy Ships. 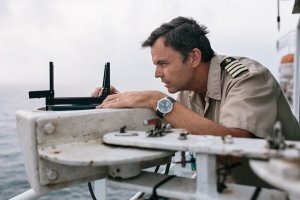 The Borrow family joined the current flagship, Africa Mercy, in Madagascar in 2015, allowing John to claim that he’s been the Chief Officer on every Mercy Ship except for one. He took over as Captain in August 2016 and three years’ service took the family to Benin, Cameroon and Guinea. 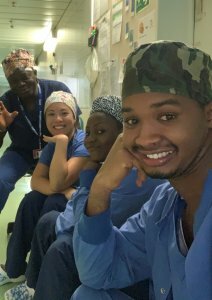 Lee-Anne used her professional skills in the Mercy Ships Infant Feeding Programme while their boys attended the onboard school for crew children. In each port Lee-Anne worked with the Mums of severely underweight babies. These infants with cleft palates require additional nutrition so they would be strong enough to undergo plastic surgery to reconstruct their clefts. Captain Borrow and his family have now returned home, leaving a vacancy in his role. When M’Mah was born, her mother had a simple wish for her daughter’s life. ‘I want her to be like a diamond — to shine bright,’ she said. Unfortunately for most of M’Mah’s life, the light inside her was overshadowed by the neurofibroma growing on her face. When she was just a baby, her parents noticed a small lump and dark hairs growing above her left eye. By the time she was five years old, M’Mah’s neurofibroma was drooping over her forehead like a sac and beginning to dislocate her eye. Over time, more lumps started to develop on her skull and upper lip, causing severe swelling. Even at her young age, other kids noticed M’Mah’s differences, which led to bullying and name-calling. They would call her ‘sick’ and avoid playing with her because they were afraid of her. As a result, she was spending her childhood on the sidelines. She refused to go to school, even though her parents desperately wanted her to have an education. ‘She was so scared… she said everybody would laugh at her,’ said M’Mah’s mother. With a heavy shroud of insecurity and fear surrounding M’Mah, it was hard to see the sweet, playful girl inside, waiting to be let out. The family was poor and struggled to provide enough food for their two children, so an expensive, complicated surgery was out of the question. Her parents prayed every day for healing for their daughter. 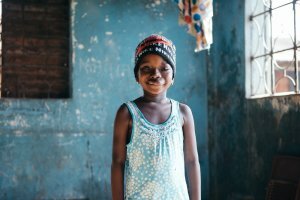 When they heard about Mercy Ships, M’Mah’s mother was overjoyed. It was the first time that she’d dared to believe her daughter might receive surgery. 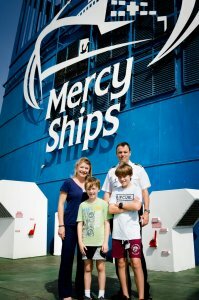 The family travelled for hours to get to the Africa Mercy, but the end goal was worth every arduous mile. Soon, a volunteer plastic surgeon specialising in neurofibromas removed the tumour M’Mah had carried for years. In the weeks following her operation, M’Mah spent time on board being showered in love and friendship by the nurses, crew and other patients. Esther from Taupo spent many hours playing with the little girl to help her pass away the hours as she recovered from her massive surgery. Freed from worry, the sweet five-year-old slowly emerged from her shell, and her inner diamond began ‘to shine through. Esther says that on days when I couldn’t make it down to the hospital to play with her, M’Mah asked the translators where her special friend was. Thanks to her growing confidence, M’Mah is no longer afraid to start school and will begin her education next year. As a sports therapist with 17 years’ experience, Emma has many high profile clients including an impressive list of All Blacks. What is equally impressive is her commitment to give her best, personally and professionally, to people in extreme poverty in West Africa. This is Emma’s first experience with Mercy Ships. She read about the charity in various magazines and thought the concept of using her skills in sounded ‘amazing’. Emma worked extensively with Sema after surgery straightened his legs. It was her job to reteach him how to walk. 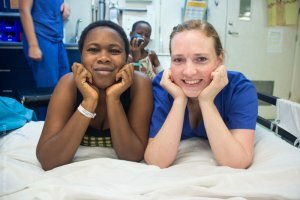 ‘I tell each patient and their caregivers how awesome they are, how proud they should be of their son/daughter/niece/nephew/neighbour, and how well they are working at doing the exercises.’ Emma works hard to communicate through her translator to each child that she understands how tough the operation was, and how tough the exercises are. She reminds each patient that they are incredible and unique. We meet Janine as she drives Dr Neil Thomson from the Mercy Ship to Alya’s village. 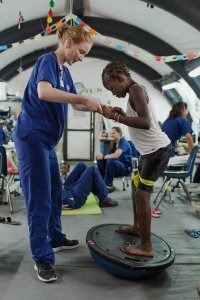 She had worked a lot of overtime this week in her role as the Mercy Ships Purser, but she is happy to negotiate the ship’s 4WD through the hectic, erratic traffic of Conakry in order to find the little boy who had surgery onboard five years ago. Wound Care Nurse and IT Specialist from Mt Eden. Steph’s previous experience serving onboard the hospital ship as a ward nurse paved the way for her to return into the role of wound care coordinator – an extremely demanding and highly skilled role. It’s the job of Steph and her team to change the wound dressings for patients post-surgery. Particularly for the patients who have had skin grafts reconstruction after surgery to release burn scars, this can be a painful ordeal. The wound care team have learned to synchronise their work, particularly with their youngest charges; one entertaining and distracting the patient with songs, games and surprises while the other dresses the wound. Steph’s gentle, fun manner and huge smile means even the smallest children develop a level of trust that enables them to undergo this tough procedure to bring about complete healing. The couple are on board this time for the entire 10-month Guinea field service. Operating Theatre Nurse from Glendene. She was still in nursing school when the Mercy Ship bug first bit Lindsey. 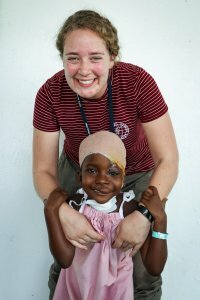 ‘I was instantly drawn to the vision of Mercy Ships and I just knew I had to serve on board one day,’ she reflects. The highlights for Lindsey included the opportunity to get to know the patients outside of theatre, while they were awake – a very unusual experience for an operating theatre nurse! ‘I recall a female teenager we operated on who had a large, growing parotid gland to the right of her face,’ explains Lindsey. ‘I went to visit her in the ward during the evening. Her face was bandaged, and she told me her story. The tumour had been was growing for the past seven years and had socially impacted her life. She enjoyed studying science and English but stopped attending school because she was ridiculed and stared at by her peers. As I was speaking with her, a shy smile appeared on her face. She told me that when she leaves the hospital she is going to return to school because then she will look beautiful and nobody will stare at her.